Cooking chicken on a rotisserie is one of the best ways to get juicy and succulent pieces of meat. Combine this with the Caribbean spices of adobo seco and you’re sure to have a new crowd favourite. For the adobo seco spice mix, combine all the ingredients together and store in an airtight container. To make Heston’s red pepper oil, roast the pepper above glowing charcoal until blackened on all sides. Carefully remove and place into a plastic bag until cool enough to handle. Peel away the blistered blackened skin and discard. Open up and remove the seeds and white membrane. Place the cleaned red flesh into a food processor, add the oil and blitz until smooth. Season and pass through a fine sieve. Transfer to a squeeze bottle and set aside. Ignite the BBQ as per instructions and set up for rotisserie. Wash the chicken inside and out and dry with kitchen paper towelling. Divide the olive oil equally into two containers. One is for the spice rub; the other will be for the basting marinade. In one of the containers combine the lemon zest, sliced garlic, a quarter of the thyme sprigs, 1 tablespoon of adobo seco and the bay leaves. This is the basting oil. In the other container of olive oil, combine 1 tablespoon of adobo seco. Rub this mixture all over and inside the chicken. 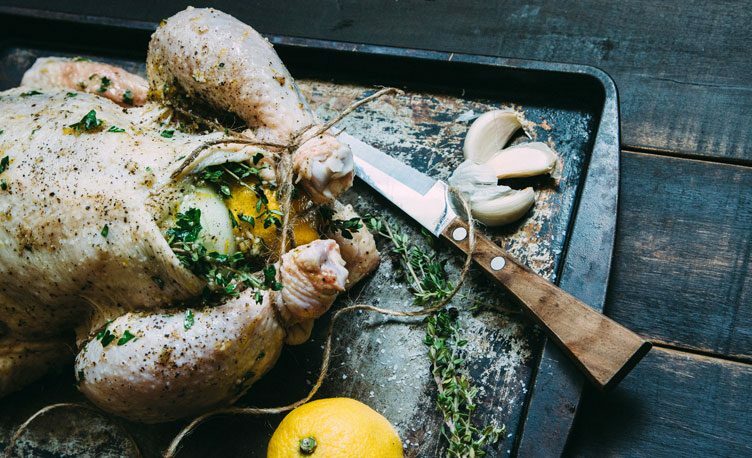 Place the remaining thyme sprigs and lemon slices inside the chicken’s cavity. Place the chicken onto the spindle and secure with the clip lock forks. Truss the legs neatly with butcher’s string. Place onto the rotiscope and set at the 2nd highest position. Lightly baste every 15 minutes and cook until the internal temperature (between the breast and thigh) reaches 74°C. Carefully remove and rest covered for 10 minutes. Serve sliced with a light scattering of smoked salt, red pepper oil and mangetout.